In his presentation at the 2019 Annual Practical Recommendations in Immuno and Molecular Oncology Meeting in Maui, Hawaii, Agarwala reviewed survival statistics of patients with melanoma being treated at different stages of their disease. Patients with distant metastases have 5-year survival rates of 22.5% versus 63.6% in patients with regional, node-positive disease.2 However, patients with stage II/III disease still account for a significant proportion of melanoma-related deaths in the United States. The once-favored interferon (IFN)-alfa regimens for adjuvant therapy suffered from conflicting efficacy data, controversy over dosage schedules,3 and a high toxicity burden. This led IFN-alfa to be surpassed by newer immunotherapy and targeted agents that have moved to the forefront. Despite this, ipilimumab had significant toxicities. Almost all patients (98.7%) experienced adverse effect (AEs) of any grade and about half of patients (54.1%) had grade 3/4 AEs, leading to treatment discontinuation in 53.3% of patients. Nivolumab (Opdivo) monotherapy is approved for multiple indications in melanoma, including the adjuvant treatment of node-positive disease, based on results of the phase III CheckMate 238 trial. The trial compared adjuvant therapy of ipilimumab with nivolumab in patients who underwent complete resection of stage IIIB/C or IV melanoma.5 Study investigators found that nivolumab improved median RFS over ipilimumab by 6.7 months (P <.0001) and resulted in fewer AEs of any grade. Treatment-emergent AEs led to discontinuation in 10% of patients in the nivolumab arm compared with 43% of patients in the ipilimumab arm. Similarly, promising results were observed in the phase III EORTC 1325-MG/KEYNOTE-054 trial with the use of pembrolizumab (Keytruda) in patients with completely resected stage III melanoma.6 The rate of 1-year RFS in the experimental arm was 75.4% versus 61.0% in the placebo arm (HR, 0.57; 98.4% CI, 0.43-0.74; P <.001). Grade ≥3 AEs occurred in 31.6% of patients taking pembrolizumab versus 18.5% of patients receiving placebo. These data prompted an expanded FDA approval in February 2019 (see page 6). Roughly 40% to 50% of all melanomas have mutations in the BRAF gene and respond well to BRAF/MEK inhibitor combination regimens.1,7 The combination of dabrafenib (Tafinlar) plus trametinib (Mekinist) has been approved for the treatment of BRAF-mutated metastatic melanoma since 2014, but an approval in April 2018 has brought it to the adjuvant setting following surgical resection. In the phase III COMBI-AD trial, dabrafenib plus trametinib was compared with placebo in patients with stage III disease who harbored BRAF V600E or V600K mutations following complete resection.8 The estimated rate of 3-year RFS was improved by 19% with the combination over the placebo (HR, 0.47; 95% CI, 0.39-0.58; P <.001), and the toxicity profile was comparable to earlier trials. When deciding between immunotherapy and BRAF/MEK targeted therapy, physicians need to consider the therapies’ toxicity profiles. Toxicities from combination therapy with dabrafenib and trametinib are manageable and can be relieved if treatment is delayed or discontinued; conversely, AEs with anti–PD-1 therapy occur at lower incidences but can be more severe and may not resolve with a treatment delay. Based on the information from the previous 3 trials, AEs with dabrafenib plus trametinib led to the most treatment discontinuations (FIGURE). 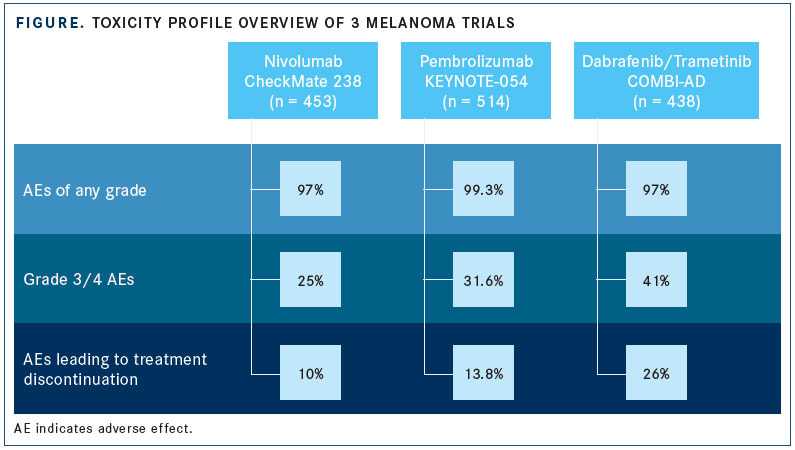 The combination of nivolumab plus ipilimumab is being studied in patients with stage III melanoma and may result in more treatment options for this patient population (NCT02437279). Other areas of research include the use of these therapies in patients with high-risk stage II disease and as neoadjuvant therapy in resected stage IV disease. Agarwala SS. Melanoma: a new paradigm in adjuvant therapy. Presented at: 2019 Annual Practical Recommendations in Immuno and Molecular Oncology Meeting; January 30-February 2, 2019; Maui, HI. Cancer stat facts: melanoma of the skin. National Cancer Institute website. seer.cancer.gov/statfacts/html/melan.html. Accessed February 14, 2019. Ives NJ, Suciu S, Eggermont AMM, et al; International Melanoma Meta-Analysis Collaborative Group (IMMCG). Adjuvant interferon- for the treatment of high-risk melanoma: an individual patient data meta-analysis. Eur J Cancer. 2017;82:171-183. doi: 10.1016/j.ejca.2017.06.006. Eggermont AMM, Chiario-Sileni V, Grob J-J, et al. Prolonged survival in stage III melanoma with ipilimumab adjuvant therapy. N Engl J Med. 2016;375(19):1845-1855. doi: 10.1056/NEJMoa1611299. Weber JS, Mandalà M, Del Vecchio M, et al. Adjuvant therapy with nivolumab (NIVO) versus ipilimumab (IPI) after complete resection of stage III/IV melanoma: updated results from a phase III trial (CheckMate 238). Presented at: American Society of Clinical Oncology 2018 Annual Meeting; June 4, 2018; Chicago, IL. ascopubs.org/doi/abs/10.1200/JCO.2018.36.15_suppl.9502. Eggermont AMM, Blank CU, Mandala M, et al. Adjuvant pembrolizumab versus placebo in resected stage III melanoma. N Engl J Med. 2018;378(19):1789-1801. doi: 10.1056/NEJMoa1802357. Targeted therapy for melanoma skin cancer. American Cancer Society website. cancer.org/cancer/melanoma-skin-cancer/treating/targeted-therapy.html. Updated June 28, 2018. Accessed February 14, 2019.